Karratha is a city in the Pilbara region of Western Australia, adjoining the port of Dampier. It was established in 1968 to accommodate the processing and exportation workforce of the Hamersley Iron mining company and, in the 1980s, the petroleum and liquefied natural gas operations of the North West Shelf Venture. At June 2018, Karratha had an urban population of 16,708. The city's name comes from the cattle station of the same name, which derives from a word in a local Aboriginal language meaning "good country" or "soft earth". The city is the seat of government of the City of Karratha, a local government area covering the surrounding region. 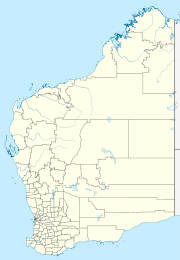 Karratha, an isolated city, is located approximately 1,535 kilometres (954 mi) north of Perth and 241 kilometres (150 mi) west of Port Hedland on the North West Coastal Highway. It is at the south central end of Nickol Bay, which has had settlements on the bay since the 1860s. The town is roughly rectangular in layout and is located on flat land adjacent to Nickol Bay. Tidal salt flats and areas of mangrove separate the town from the sea. Immediately to the rear of the town (south) lies a line of low hills. Karratha has a hot semi-arid climate, that just avoids a desert climate classification. Temperatures are warm to hot all year round, with low rainfall, most of which falls in late summer due to the influence of tropical cyclones and the monsoon, although there is a second rainfall peak in early winter as the northern edges of cold fronts occasionally cause rain in the region. It is very rare for any rain to fall in the period from August to December. Winter temperatures rarely drop below 10 °C, while maximums stay in the mid to high 20 °C's and days are sunny with low humidity. Summers are very hot and usually dry although the erratic influence of the monsoon can cause periods of high humidity and thunderstorms. The record high temperature is 48.2 °C (118.8 °F), while the record low is 6.9 °C (44.4 °F). The highest monthly rainfall on record was 348.8mm (13.7 in) in February 2011, owing to the passage of Tropical Cyclone Carlos and several other monsoonal lows over Karratha. In June 2018, there were 16,708 people in Karratha, a decline from the recent peak of 17,927 in 2013. 65.7% of people in Karratha were born in Australia. The next most common countries of birth were New Zealand 5.3%, Philippines 3.0%, England 2.9%, South Africa 1.5% and India 1.3%. 76.2% of people in Karratha spoke only English at home. Other languages spoken at home included Tagalog 1.7%, Filipino 1.1%, Afrikaans 0.8% and Mandarin 0.7%. The most common responses for religion were No Religion 35.3% and Catholic 22.0%. Aboriginal and Torres Strait Islander people, predominantly Ngarluma, make up 10.1% of the population. The Yinidbarndi, Yaburara, Mardudhunera, and Woon-goo-tt-oo peoples have lived in the surrounding area for approximately 50,000 years. Karratha's economic base includes the iron ore operations of the Rio Tinto Group, sea-salt mining, ammonia export operations, North West Shelf Natural Gas Project, Australia's largest natural resource development and the newest Natural Gas Project called Pluto LNG which is situated adjacent the existing North West Shelf LNG facility. Karratha came into being in 1968 due to the tremendous growth of the iron-ore industry and the need for a new regional centre caused by a shortage of land in Dampier. Karratha has the largest shopping centre in the Pilbara, Karratha City, which has major food and grocery retailers and department store chains. It was opened in 1986 as Karratha City and expanded in 2005. The centre also serves the neighbouring towns of Dampier, Wickham and Roebourne. There is also a smaller centre, Karratha Village, which has health services including a pharmacy and medical and dental practices. The Karratha Health Campus is the hospital that services the greater City of Karratha local government area, newly opened in 2018. Education is provided through four public primary schools, one independent public school and one private primary school, one public and one private high school, a TAFE centre with remote university facilities. A new, state of the art library was open in 2018 Karratha Public Library. A new hospital was opened in 2018, Karratha Health Campus. Red Earth Arts Precinct opened in 2018. This venue has a theatre that can also operate as an indoor cinema, outdoor cinema, rehearsal rooms and art spaces. Karratha Airport has two passenger airlines servicing the city with regular schedules: Qantas and Virgin Australia. The airport also serves as the hub of the Pilbara's light-aircraft and helicopter services, enabling contractors to access offshore destinations and other parts of the region. Each year in August Pilbara Iron, Dampier Salt, Woodside Petroleum Limited, and other smaller companies sponsor one of the largest festivals in the North West, over two days. The name FeNaClNG Festival is derived from Fe (iron), NaCl (salt) and NG (natural gas). Karratha is composed of 9 main suburbs: Karratha City Centre, Bulgarra, Pegs Creek, Millars Well, Nickol, Nickol West, Baynton, Baynton West, Tambrey and one industrial area, known as both the LIA (Light Industrial Area) and KIE (Karratha Industrial Estate). Karratha's housing development continues, with new villages and suburbs being built. Baynton West is currently being developed. Also a new suburb going east of Bulgarra with an indigenous name, Mulataga has received council approval. There is current development of a second industrial estate: Gap Ridge which is west of the city, past the cemetery. ABC North West WA (6KP: 702 AM) - (Part of the ABC Local Radio Network). ABC Radio National (6ABCRN: 100.9 FM) - Speciality talk and music. The Spirit Network - Radio 6KA (102.5 FM) - Classic Hits / Adult Contemporary Music format aimed at 35 years + audience. The programming schedule is mainly the same as the Seven, Nine and Ten stations in Perth with variations for News bulletins, sport telecasts such as the Australian Football League and National Rugby League, children's and lifestyle programs and infomercials or paid programming. GWN7 produces a 30-minute regional news program each weeknight (broadcast from Bunbury) with a newsroom based in the town, covering the surrounding areas. The local newspaper is The Pilbara News (owned by Seven West Media, publisher of The West Australian). An independent local newspaper, which included classifieds, The Pilbara Echo, closed in April 2014. Newspapers from Perth including The West Australian and The Sunday Times are also available, as well as national newspapers such as The Australian and The Australian Financial Review. The North Pilbara Football League (NPFL) is an Australian rules football league with seven teams: Karratha Kats, Karratha Falcons, Dampier Sharks, Roebourne Magpies, Wickham Wolves, Port Hedland Rovers and South Hedland Swans. The Pilbara Rugby League has 6 teams: Karratha Stormers, Karratha Broncos, Karratha Roosters, Port Hedland Juniors, South Hedland Cougars and Wickham Wasps. Soccer has 5 teams: Bulgarra Glory, Karratha Snow Whites, Nickol, Dampier Red Dogs and Salt. ^ Western Australian Land Information Authority. "History of country town names – K". Retrieved 8 June 2007. ^ "NICKOL BAY". The Inquirer And Commercial News. XXXI, (1569). Western Australia. 23 December 1868. p. 3. Retrieved 17 February 2019 – via National Library of Australia. ^ "NICKOL BAY". The Perth Gazette And West Australian Times. 4, (12). Western Australia. 27 December 1867. p. 2. Retrieved 17 February 2019 – via National Library of Australia. ^ "KARRATHA AERO". Climate statistics for Australian locations. Bureau of Meteorology. April 2013. Retrieved 13 April 2013. ^ Australian Bureau of Statistics (27 June 2017). "Karratha". 2016 Census QuickStats. Retrieved 5 January 2018. ^ "Ancient Aboriginal Heritage". Karratha Visitor Centre. Retrieved 21 January 2019. ^ "Indigenous owners 'left out' of rock art site's world heritage listing talks". The Guardian. 22 March 2018. Retrieved 21 January 2019. ^ "Karratha". www.airnorth.com.au. Air North. Retrieved 26 March 2015. ^ "Karratha City Heart of the Pilbara". Karratha City. Retrieved 11 December 2014. ^ Ltd, Civica Pty. "Spydus - Locations & Hours". karratha.spydus.com. Retrieved 28 September 2018. ^ "Karratha Health Campus to open on September 19". The West Australian. 13 September 2018. Retrieved 28 September 2018. ^ "WACHS: Karratha Health Campus - Now Open!". www.wacountry.health.wa.gov.au. Retrieved 28 September 2018. ^ "Arts hub an asset for all". The West Australian. 27 April 2018. Retrieved 28 September 2018. ^ "Red Earth Arts Festival | reaf". reaf.com.au. Retrieved 28 September 2018. ^ "COSSACK | Cossack Art Award". cossackartawards.com.au. Retrieved 28 September 2018. ^ "Pilbara News". The West Australian Regional Newspapers. Retrieved 5 July 2014. ^ "Thank you and farewell". Pilbara Echo. 10 April 2014. Retrieved 5 July 2014.